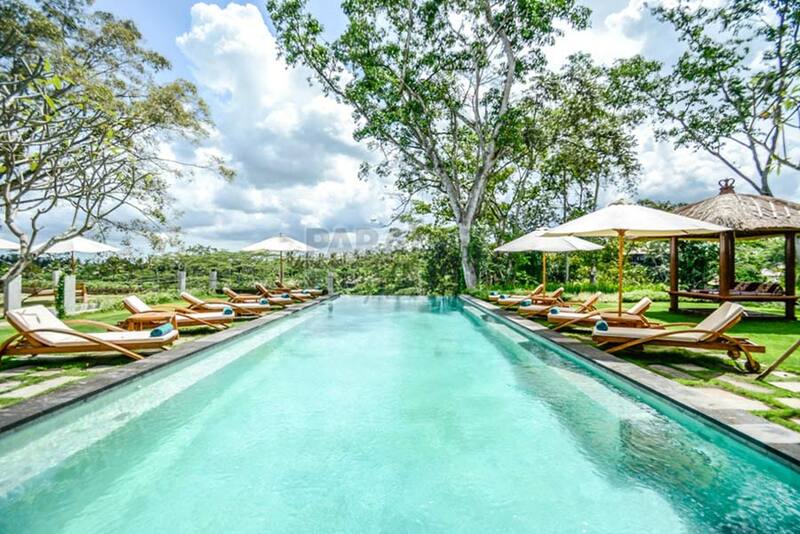 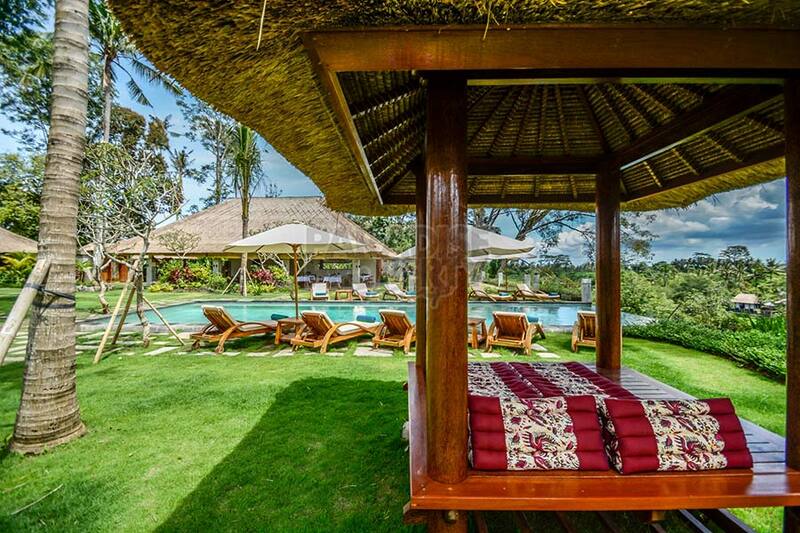 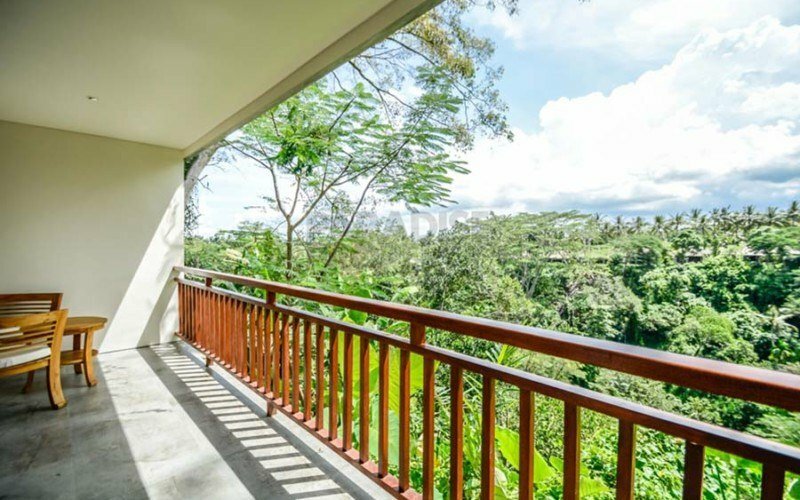 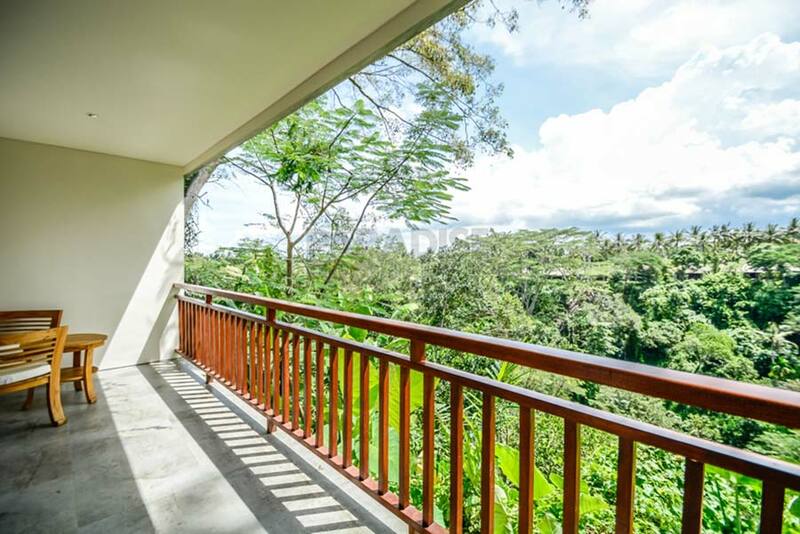 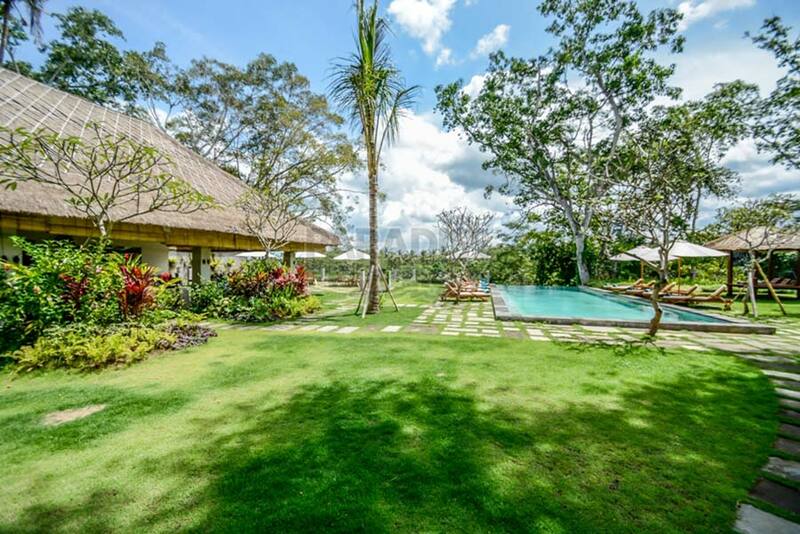 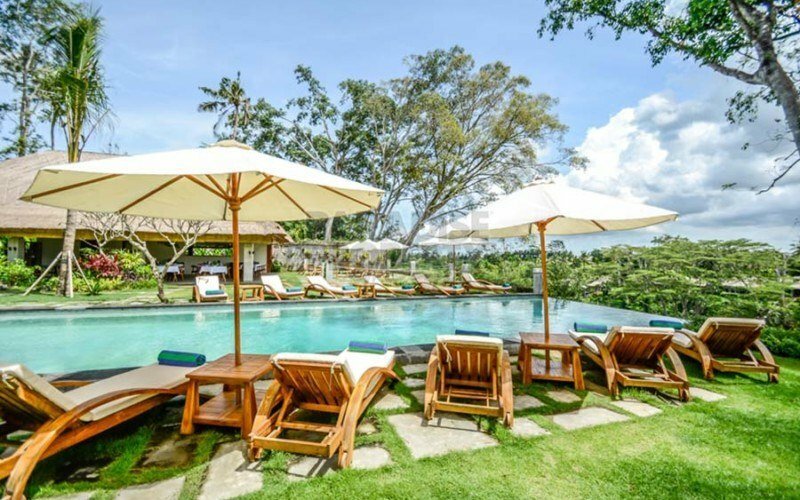 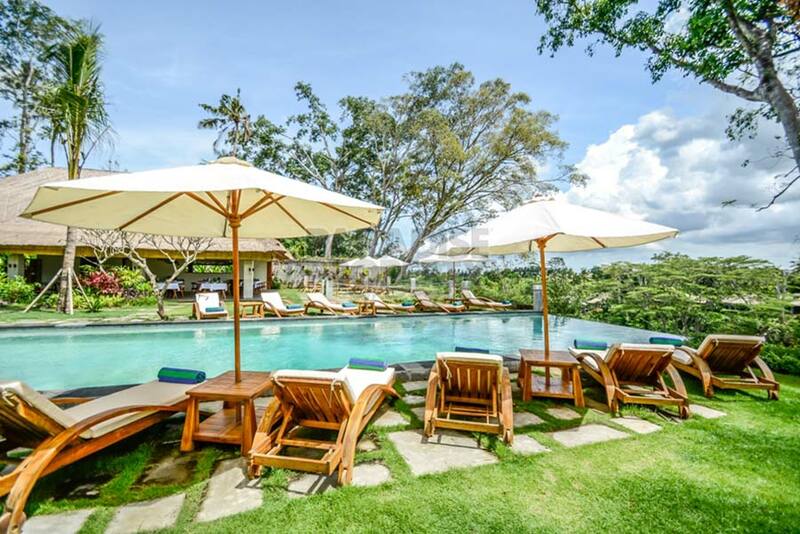 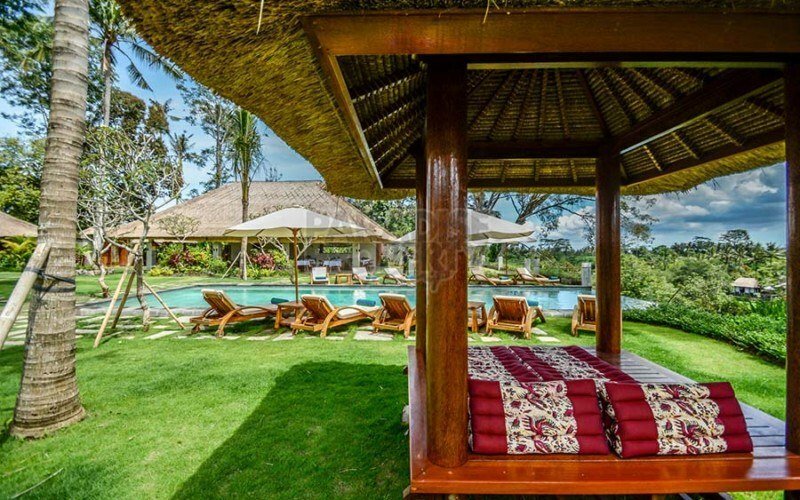 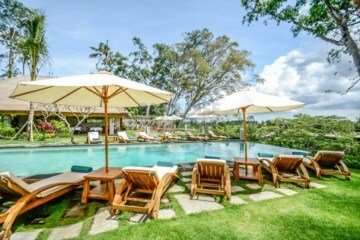 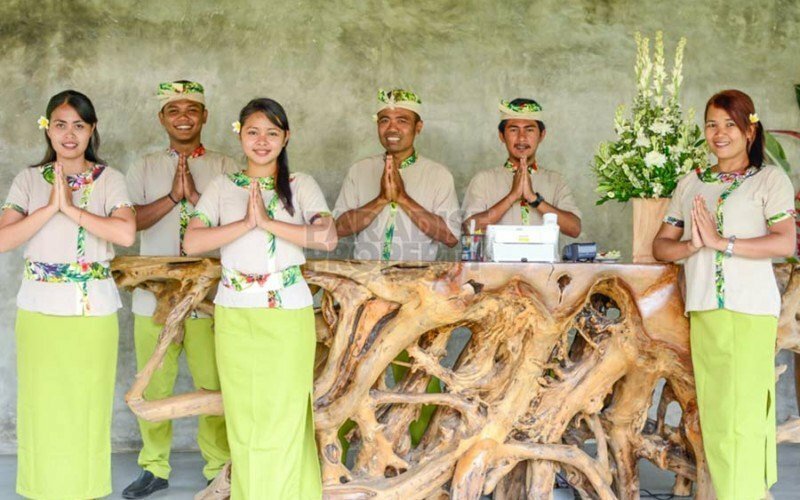 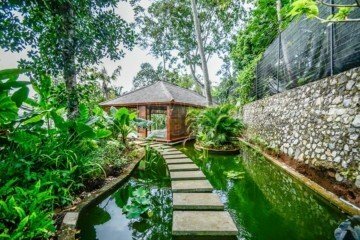 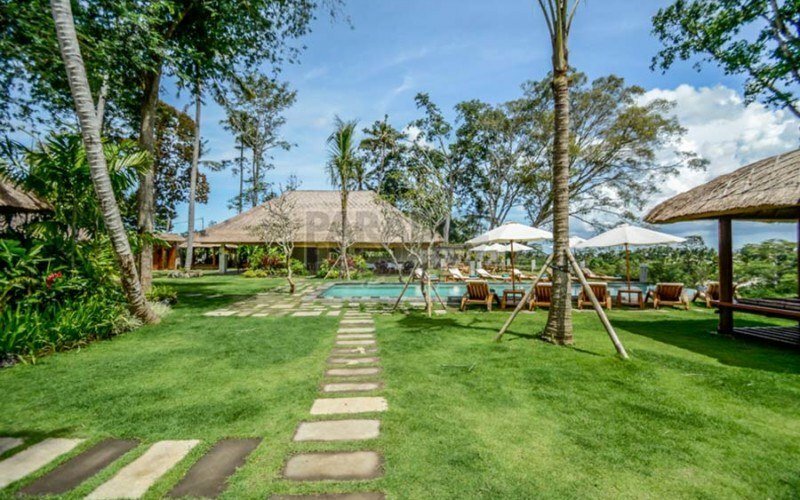 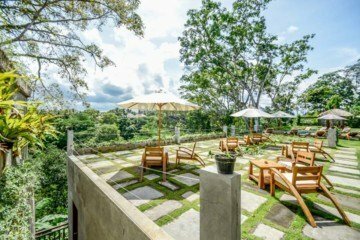 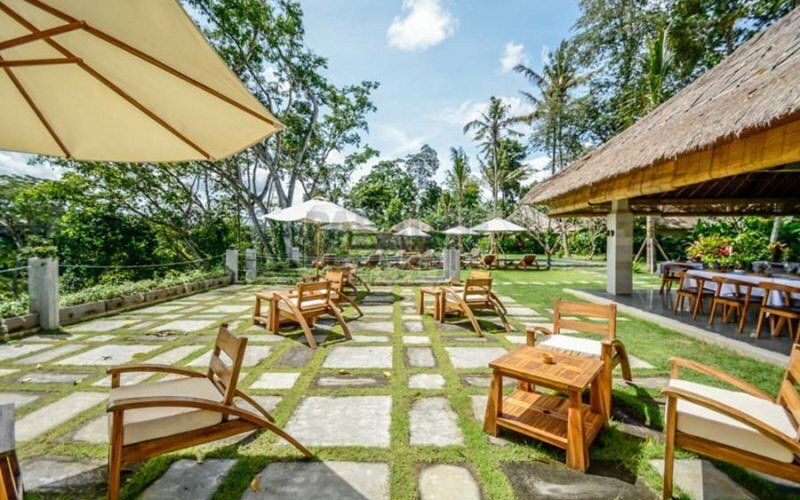 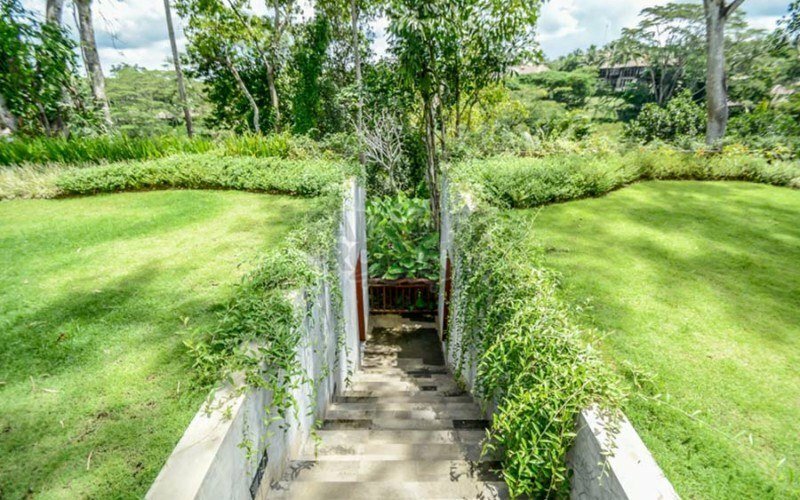 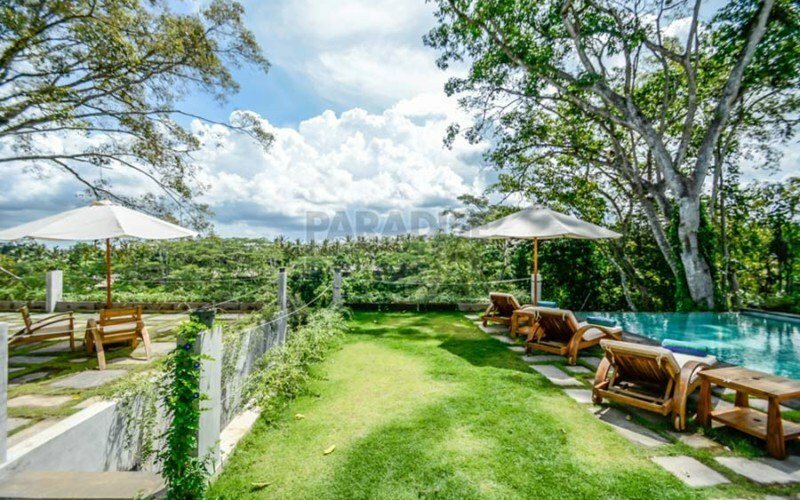 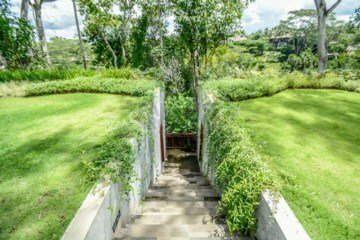 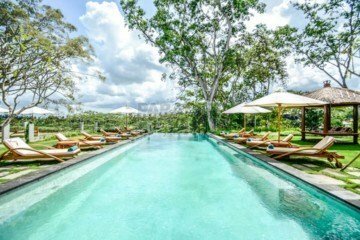 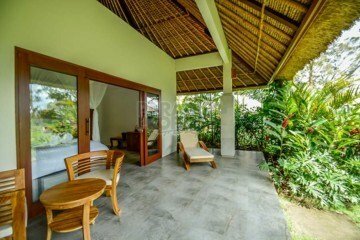 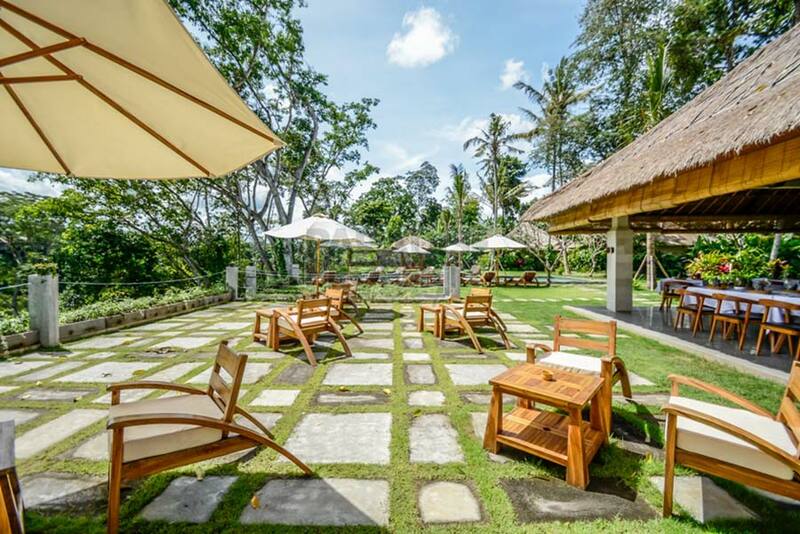 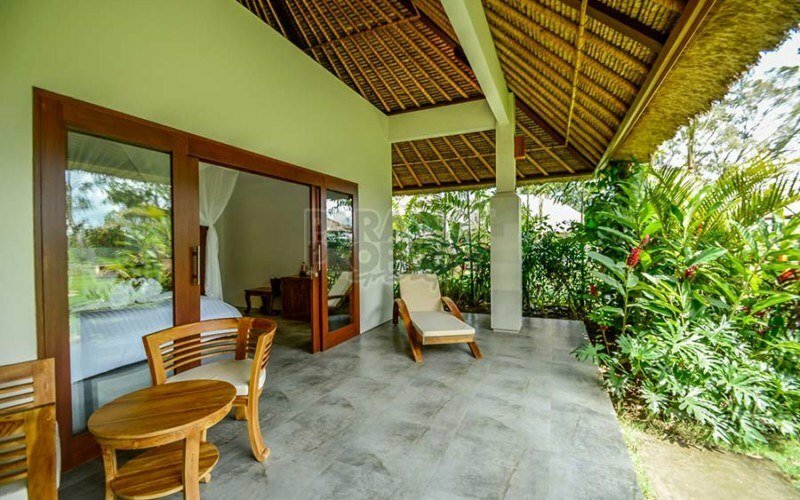 Located on the edge of the sacred Petanu river valley with its stunning views overlooking a valley of tropical rain forests, this unique resort is located a few minutes from Ubud, the traditional, artistic and spiritual center of Bali. 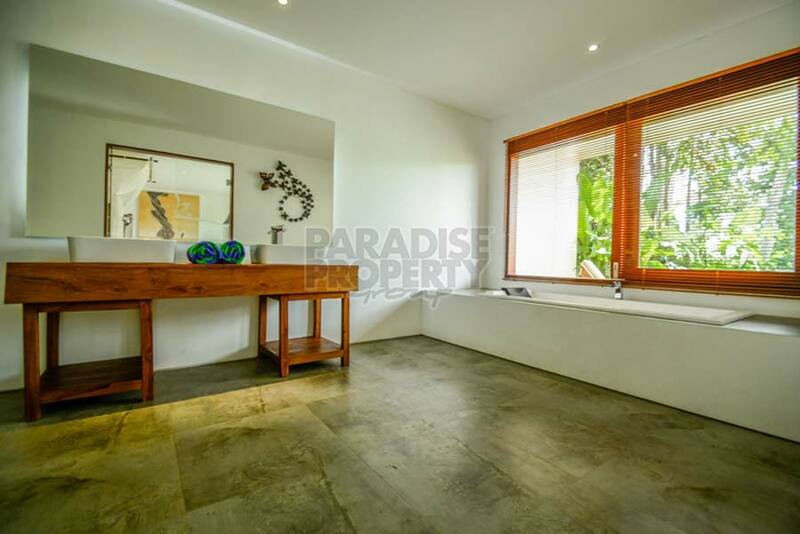 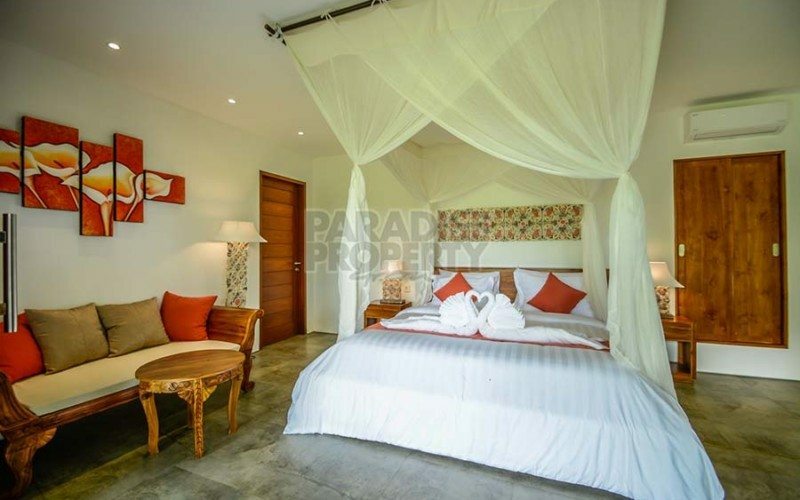 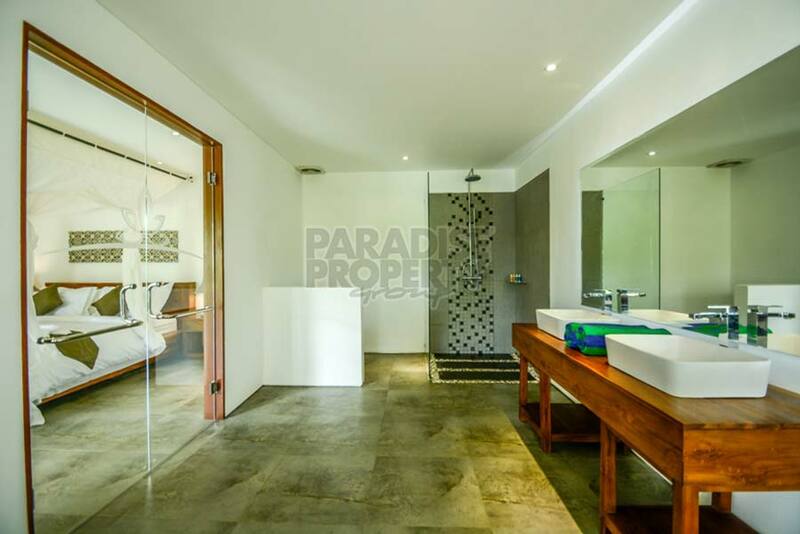 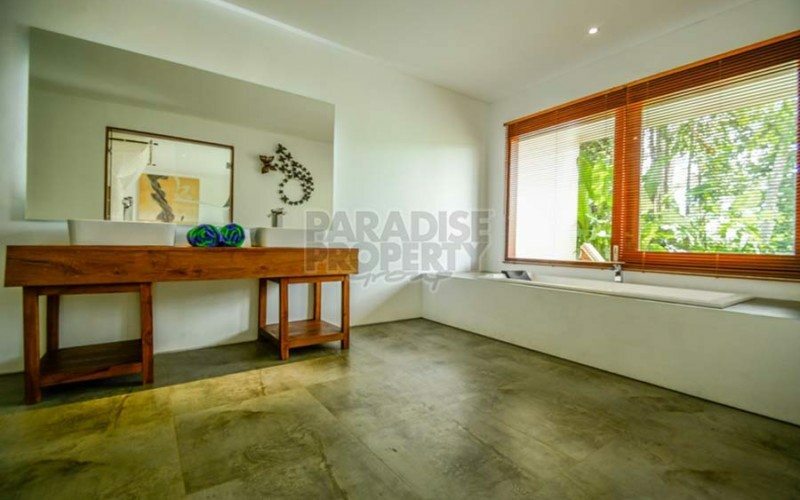 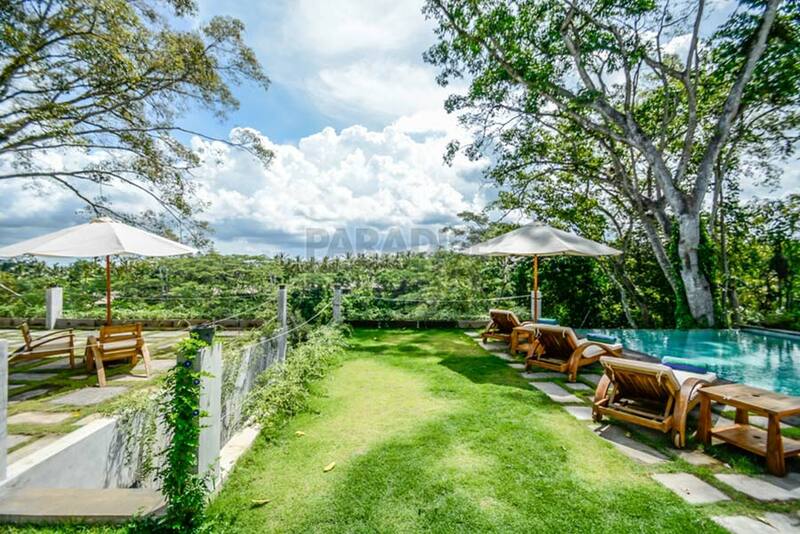 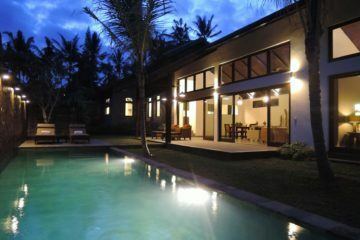 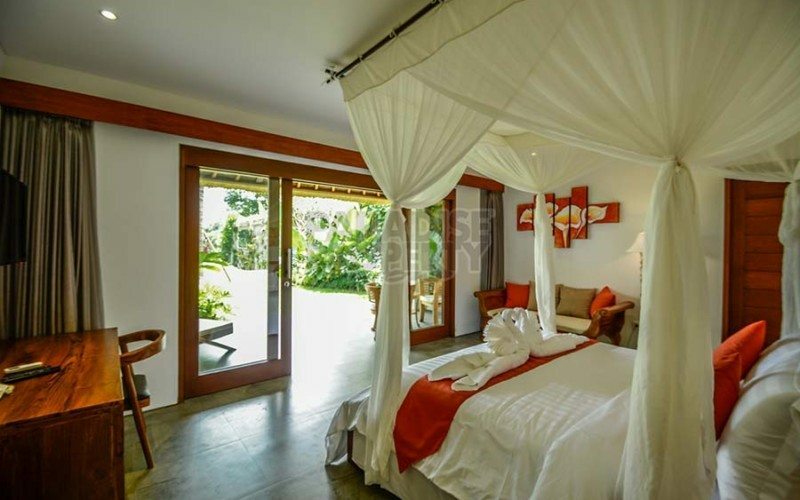 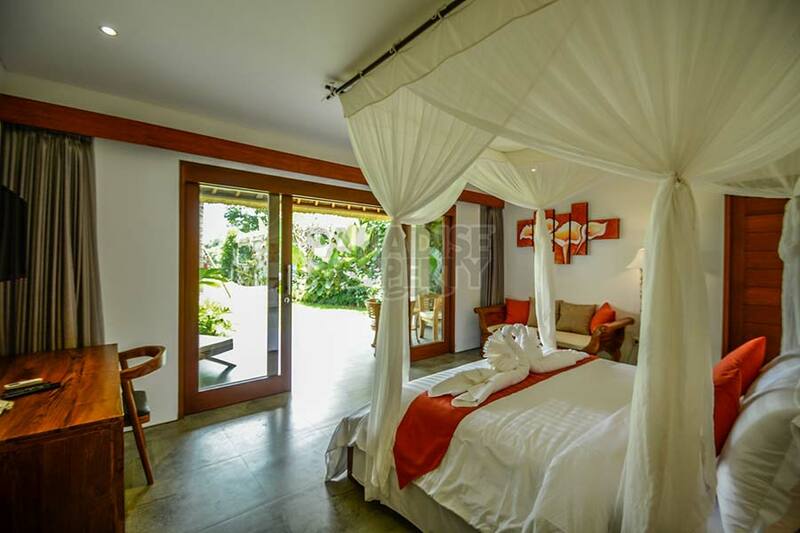 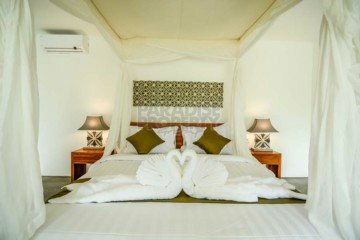 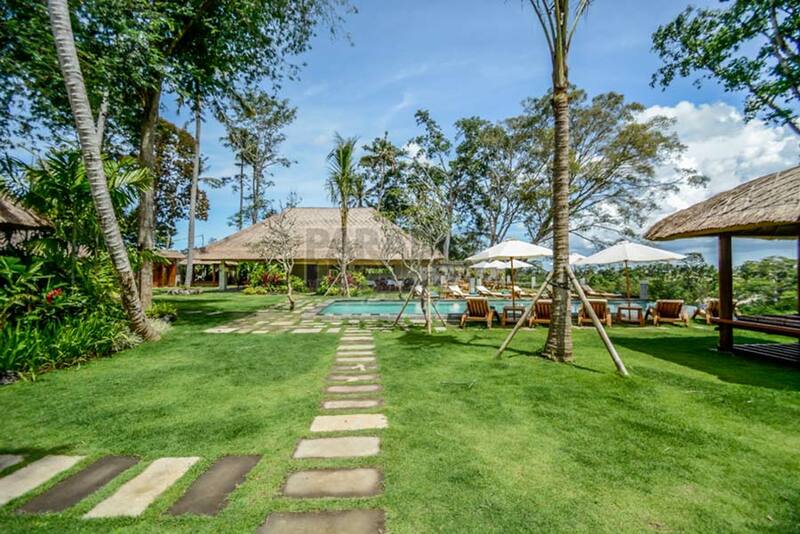 The 10 villas are nestled between beautifully landscaped gardens and consist of 4 types of villas and suites. 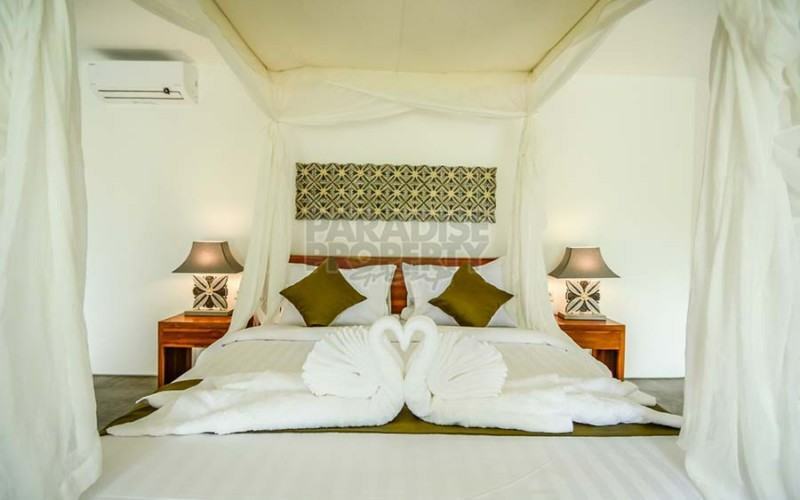 All comfortably and elegantly furnished and equipped with Air-conditioning, Satellite Television, Wifi. 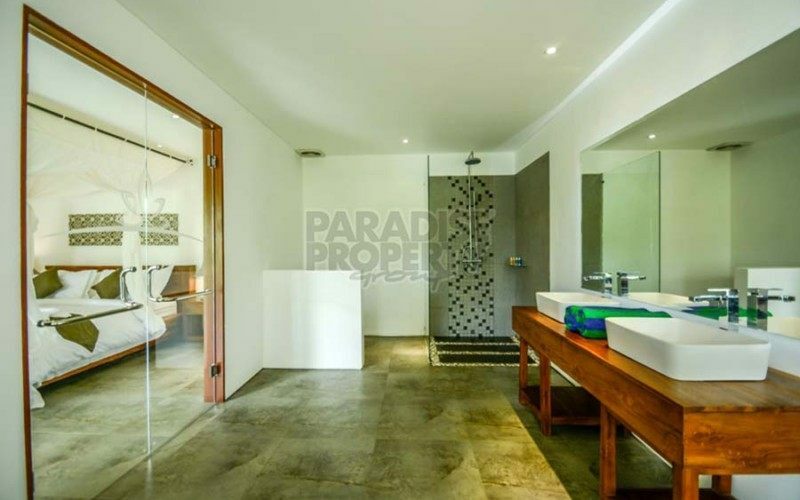 The private access road of 3 meters leads to an ample parking space and the reception area of the hotel. 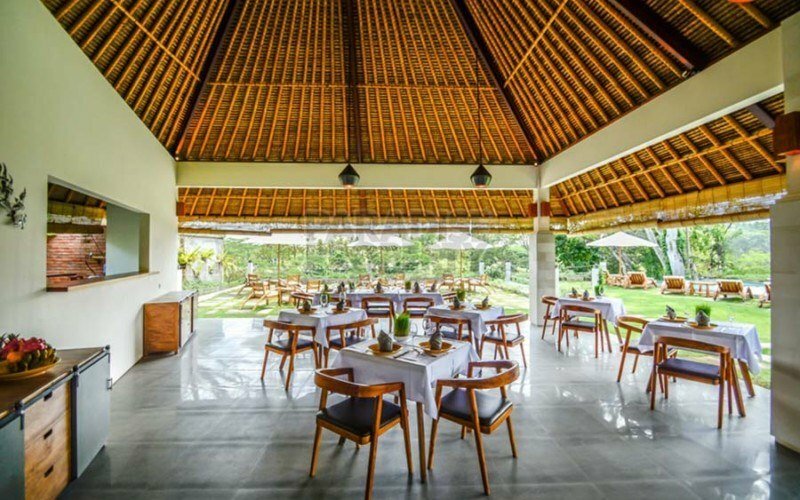 Adjacent is a beautiful restaurant with the best views in town and its very well-equipped kitchen which is specialized for healthy organic cooking with fresh products from the hotel garden. 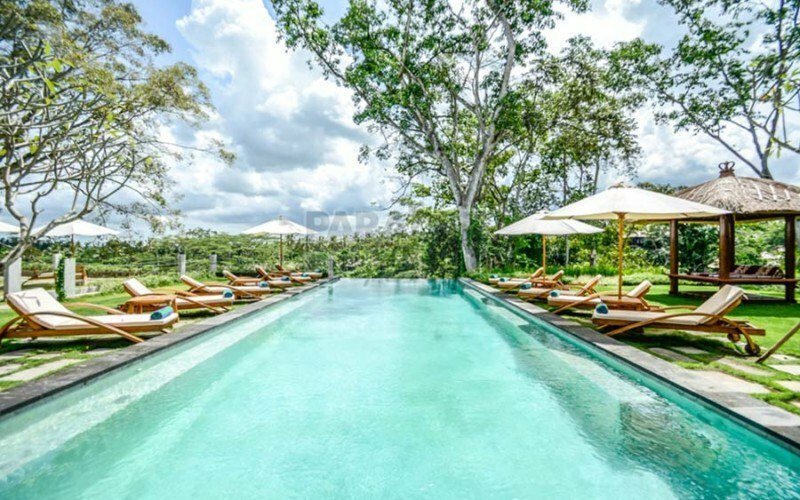 The huge infinity swimming pool of 16 x 6 meters is surrounded by luxury sunbeds and a Bale to relax and enjoy the wonderful views to the river valley. 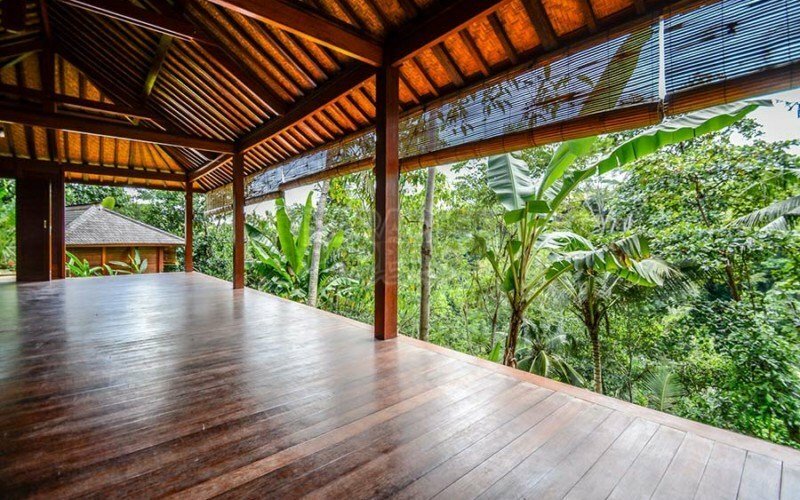 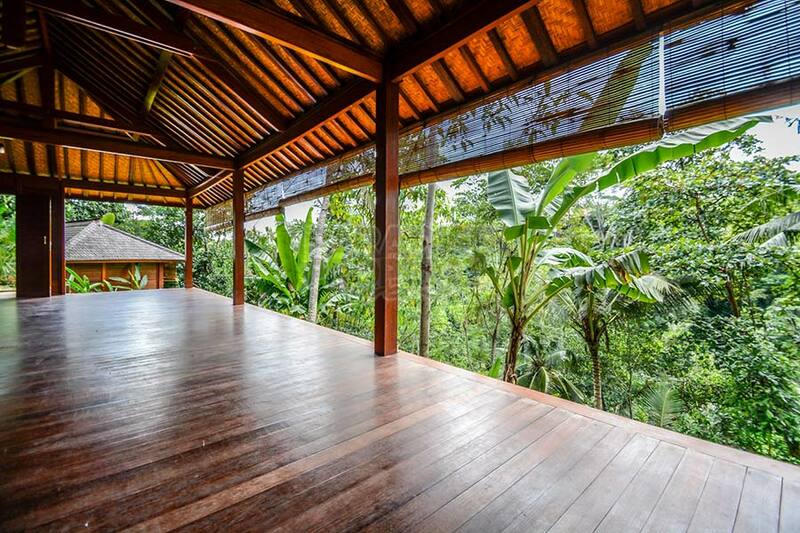 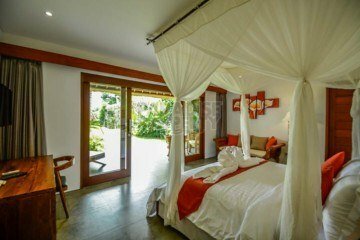 A Yoga Shala invites to meditate and to enjoy Yoga sessions in the middle of the rainforest. 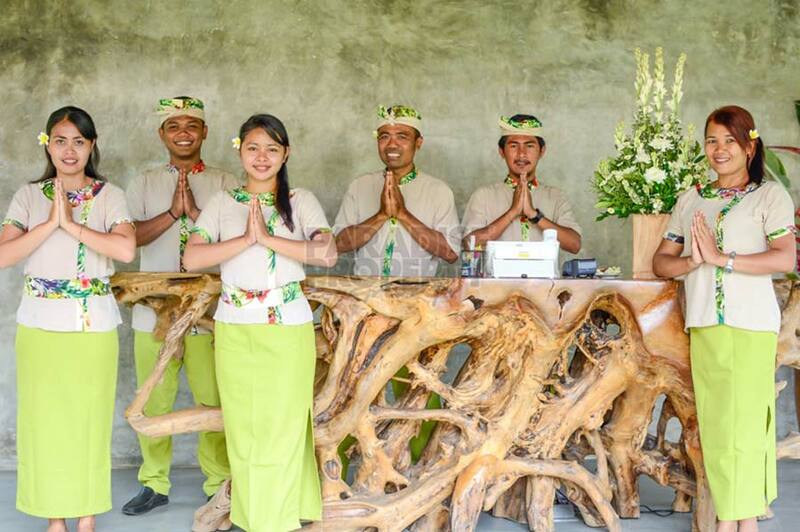 The Spa offers traditional Balinese massages by well-trained massage therapists. 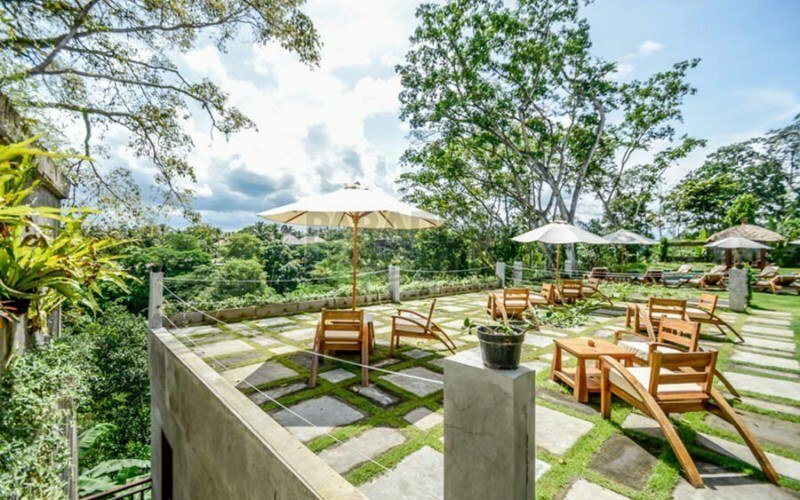 This amazing hotel is already a well-established business with a high-occupancy rate and offers a fantastic Return on Investment. 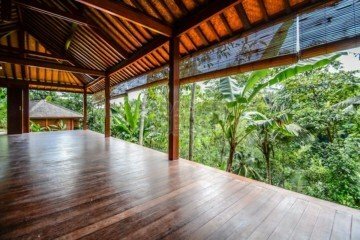 It is ideal for Yoga retreats and spiritual seminars but also for the individual traveler and family and friends gatherings. 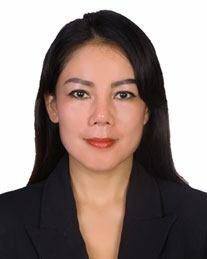 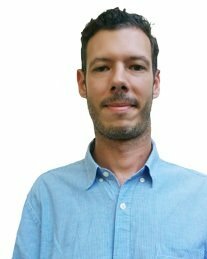 The property is sold with a lease period until 2046 with an option to extend.